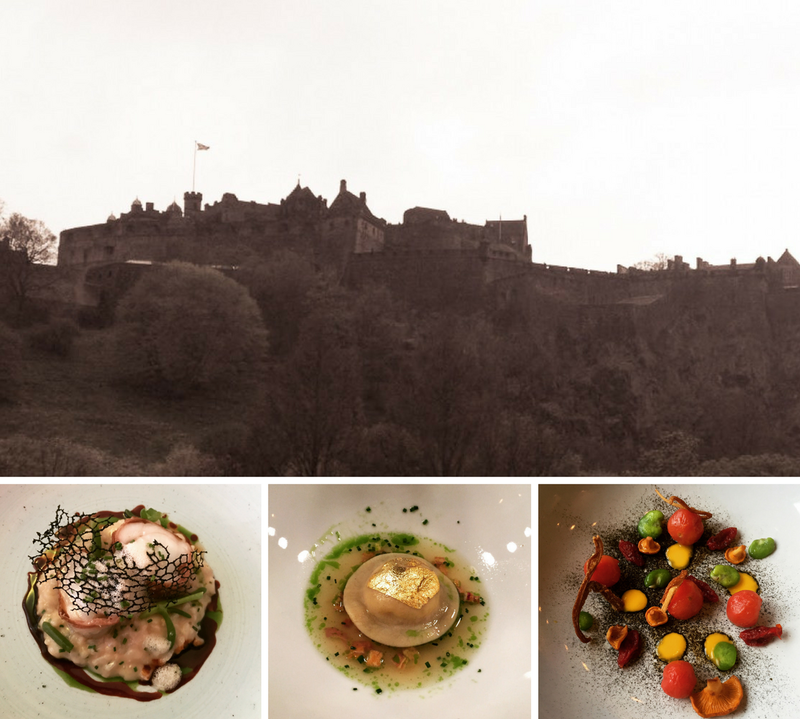 Southside Scran is another venture between Tom Kitchin and Dominic Jack. Edinburgh Feasts loves both the Kitchin and Scran and Scallie but would this be as successful as these two? If we ignore the confusion of Southside Scran actually being located on the Tollcross/Bruntsfield border rather than the traditional Southside area, this looked like it was going to be closer to Scran and Scallie than the Kitchin, acting as a local neighbourhood bistro. The difference with this restaurant was that they were offering much of the food cooked on a rotisserie. We were welcomed and taken to our table. Somewhat disappointingly we were sat in a corner where I was facing a curtain and my friend was facing a wall (which seemed to have something greasy splashed up it). We’d booked almost three weeks prior, perhaps this wasn’t early enough to avoid this table. We ordered our food – I chose the octopus followed by a special of rotisserie shoulder of lamb. My friend opted for the shellfish ravioli followed by monkfish. We were brought some bread with butter, chicken liver parfait and cornichons. However, we had no side plates which was odd and difficult when given bread and spreads. We had to balance the bread and knives on our place mats, which resulted in crumbs all over the table, which they did not offer to clear for us. All a bit odd. The bread itself was nice apart from the end which was difficult to bite into. The parfait was delicious and the butter beautifully spreadable. My octopus carpaccio was pretty on the plate, fanning out in a lovely circle. This was pleasant and I did enjoy the lemon dressing which was lots of little bursts of lemon but it was probably too much for the octopus, as little flavour was derived from the seafood itself. There were little crunchy elements with tiny croutons and a scattering of capers to add some sort of contrast to the lemon. My dining companion was enjoying her shellfish ravioli. A single large ravioli was packed full and sat in a lovely shellfish bisque. We decided to take a punt on desserts and both ordered the chocolate tart. On arrival, mine had clearly moved across the plate as there was a chocolate patchy smear that was not on my friend’s plate (so not a fancy plate dressing). The tart itself was incredibly intense in flavour but surprisingly light in texture. It came with a delicious milk ice cream. However, the scoop needed to be larger to balance it out because light in texture didn’t mean it was a light dessert. My friend did struggle mid way through and had to abandon, but I managed to clean my plate. To cap off this underwhelming evening, we were overcharged on the bill. We waited a very long time to be seen by someone to rectify and actually pay the bill, which was a shame considering the excellence service throughout the rest of the meal. The bill was adjusted without a problem (it was the special which had been incorrectly priced). Overall, we were disappointed with Southside Scran. It definitely has potential but it is nowhere near Scran and Scallie in terms of both food and value for money. Maybe it’s still bedding in but it’s not what I’d expect from a Tom Kitchin venture. Would I eat here again? Only if I heard it had improved.